You are here: Home / iOS / Is Apple’s Augmented Reality Ready for the Big Time? Is Apple’s Augmented Reality Ready for the Big Time? 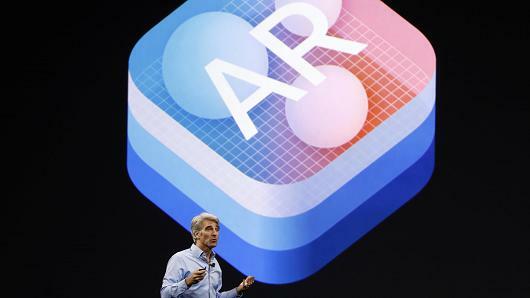 Augmented reality and ARKit 2 was a major focus of Apple’s WWDC Keynote on Monday, but is augmented reality ready for the big time yet? Craig Federighi said in his WWDC presentation that “AR is transformational technology,” and he is surely right. But its implementation might require a dramatic transformation of the way we interact with and consume information. Right now, Apple is the only company that offers built-in high-level support for augmented reality applications. 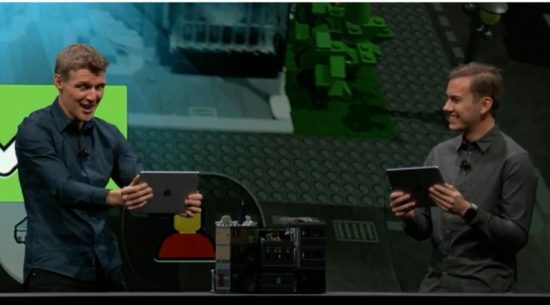 They’ve put a ton of work into developing the ARKit platform, and the demonstration of ARKit 2’s new features occupied a significant portion of their WWDC keynote. Support for ARKit is baked in to millions of devices, and all the APIs that power AR environments are public. That means developers can include the power of ARKit in their own apps without building their own augmented reality applications. It’s not quite as easy as plug-and-play, but Apple is trying to get to that level. Apple is working to make developing for AR easier for creatives and devs. They worked with Pixar to create a new file format called USDZ. This universal scene description will carry all the information required to generate an AR object in meat space. By bundling all the assets into a single file that contains all the required info for a three-dimensional object, it’s easier to work with and share AR assets between projects, developers, and creatives. USDZ will launch with support for multiple vendors, including Adobe Creative Cloud and Pixar. Adobe is also working to make creating AR assets easier for creative professionals. With support for the USDZ file type, users can stick Creative Cloud objects into AR environments. It’s potentially the first WYSIWYG augmented-reality editing platform, and has the potential to open AR development to a broader range of professionals without existing three-dimensional animation software chops. These changes and the release of ARKit 2 represent the “AR Core” experience iOS has needed to bring AR usage to the next level. Hopefully these developments will remove some of the more substantial stumbling blocks keeping more developers from designing AR content. Right now, AR is gee-whiz technology with little practical usages. And the well-developed practical uses we’ve seen have all been fairly similar. Take Apple’s new Measure app, shown of at WWDC on Monday. It uses AR measurement APIs that benefit from Apple’s tight hardware integration and precise optics. As a result, it seems to work pretty well. Measurement apps are broadly disappointing, but Measure’s demo was highly accurate. That’s one of the few cases where AR shines. In most cases, photos are more informative and useful than three-dimensional AR models. Apple is still trying to push it, of course. They showed off support for the USDZ file standard in their News app, but it’s hard to imagine adopting taking off in a big way. Those stories are reformatted content from websites. It’s hard to imagine having a art team that will provide AR assets for news stories. Who on earth is going to invest time in creating those? Perhaps we’ll see the NYT, which has tried out VR a few times, give AR a shot in some of its Sunday stories. But it doesn’t appear to provide a big enough win for publishers to be worth pursuing. The Fender Custom Shop AR demo seemed more realistic, allowing users to see their customized guitar as a three-dimensional object and at life size. That’s a fairly stable use of the technology, with a three-dimensional model that’s always the same but with different “skins.” Yet we have to wonder what this provides in the way of customer value. Will seeing the object in your house drive sales for Fender? Do people even know how to use AR well enough to make it work properly? 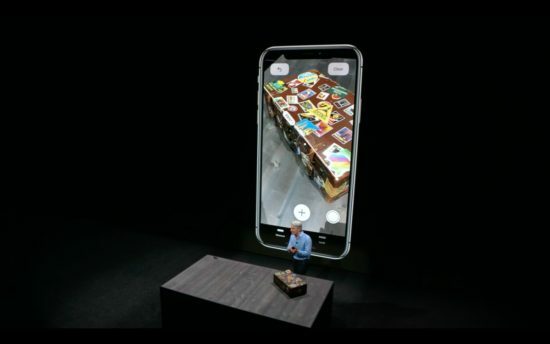 The better focus of Apple’s AR demos was on “fun” rather than practical applications. It’s an interesting approach, especially considering how large the mobile gaming market is on iOS. And there’s a potentially huge application for something that’s cool-looking but not broadly useful. The LEGO demo was a smart choice: those models don’t need highly realistic animations or graphics.. Even their real-life representations are shiny plastic, so it’s a good fit for the somewhat low-quality AR Kit animations and polygons currently powered by what must be the absolute limit of mobile device’s graphical processing capability. AR has not yet found its best use case. We’re still slapping it on existing usages of media to make “super photos” out of things, putting low-resolution three dimensional elements into poorly-lit real life environments. Perhaps a different method of display or interaction, like Apple’s long-rumored AR goggles, will improve the situation. But for now, AR seems flashy but empty. Why Did Apple Just Buy an Augmented Reality Company? Apple’s Augmented Reality is yet to grow massively. The fact that Apple is still experimenting with this new technique clearly tells about its vision of expansion in the times to come.